The Cape Town Disco Nights will bring you the magic and excitement that Disco music brought to audiences all over the world. Relive the funky Disco era with all its excitement and nostalgia. Chart-toppers of the disco times such as "I Will Survive", "Upside Down", "Respect", "We are Family" and "Jump" amongst other huge hits of Gloria Gaynor, Diana Ross, Donna Summer, Aretha Franklin and The Pointer Sisters are given new life. Their songs have become legendary hits and are still loved and enjoyed by audiences of all ages. Who are the South African Disco Divas? Disco Nights is starring Lilian Khumalo, Stella Magaba, Dorothy Engelbrecht and Dantanio Goodman. 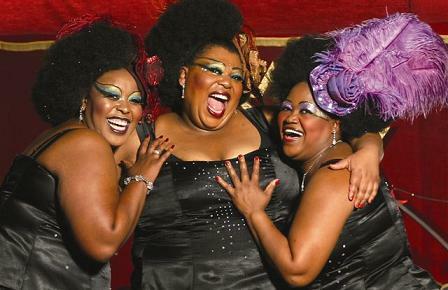 The vivacious disco divas trio is best known as The Original Tons. This trio is one of South Africa’s top female groups has entertained audiences both locally and abroad for more than seven years. Dantantio Goodman, recently seen as Sammy Davis Junior in the sell-out show The Rat Pack joins the divas’ performances with a mind-blowing tribute to the late king of Pop, Michael Jackson. These wonderful performers are joined by a live band, with direction by Paul Griffiths. The lighting is done by Jane Gosnell. How much? Tickets are R150 via Computicket, R70 for Seniors at the door. Special offers for groups of ten or more and Mondays two for one at the door except for students and Seniors.